The Petermanns lived on Conover Street in 1883. 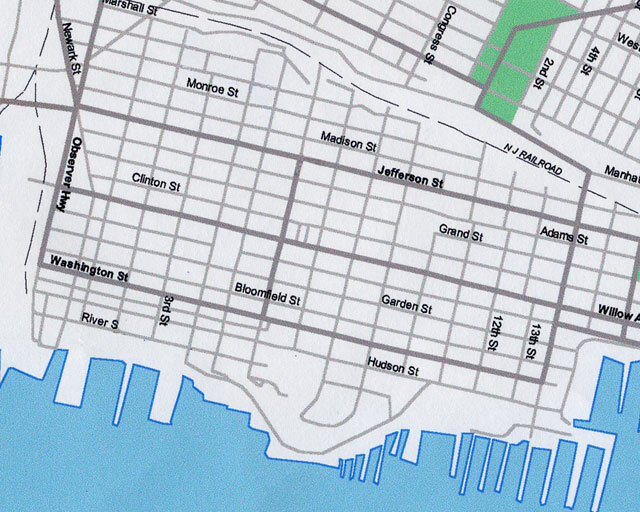 Hoboken is (or was) 18 blocks long from north to south and 16 plus blocks wide from east to west. The north/south blocks are longer than the east/west blocks. The north/south streets are in order from east to west, River, Hudson, Washington, Bloomfield, Garden, Park (formerly Meadow), Willow, Clinton, Grand, Adams, Jefferson, Madison, Monroe, Jackson, Harrison and Marshall. The north/south streets are numbered with the 100 numbers being between 1st Street and 2nd Street, the 200 numbers between 2nd Street and 3rd Street, etc. The east/west blocks are numbered with the 1 to 100 numbers between River and Hudson, the 200 numbers between Hudson and Washington, etc. 1875, 152 Park (Meadow) Ave. I could not find 152 Park. 1880, 156 Park. In 1878 Melosine Erxmeyer Blanck's sister, Julia Erxmeyer Leman was also listed in this building. I could not find 156 Park. 1897-1900, 215 Willow. Still standing. 1910-1925, 213 Willow. Still standing. Melosine Erxmeyer Blanck's sister, Julia Erxmeyer Lehman lived in this building from 1897. In 1905 the Lehmans were listed as owning the building. 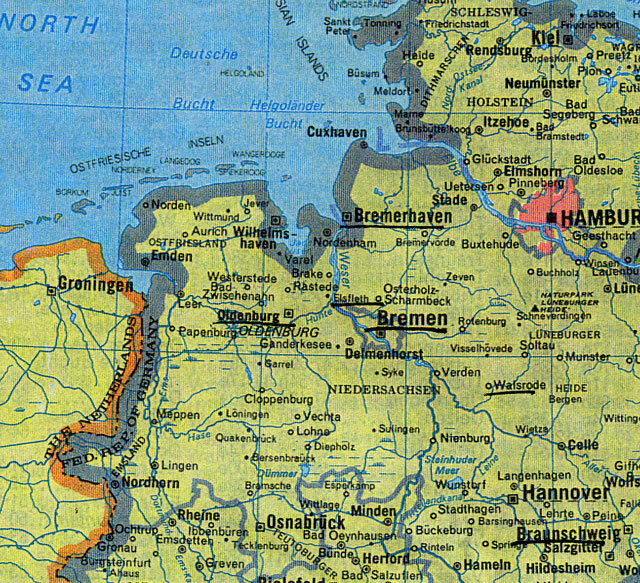 See Lehmans below. 1909, 710 Willow Avenue. Still standing. 1910, 222 Willow Avenue. Still standing. By 1920 Herman Blanck was living on Highwood Terrace in Weehawken. 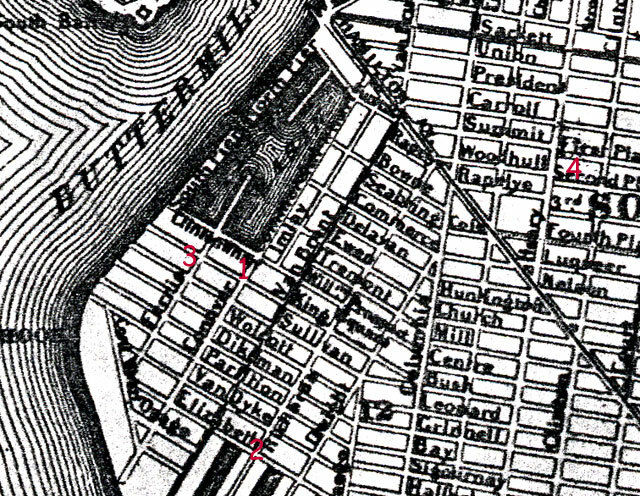 The first address I have for Louie Blanck was 185 Spring Street, West Hoboken. West Hoboken is now Union City. 1909-1910, 303 Willow Avenue. Gone. 1915-1920, 107 Willow Avenue. Still standing. 1935, 704 Willow. 1936-38, 1122 Hudson Street. Gertrude and her children lived at this address after Louie had died . 1942, 1108 Washington Avenue, John Blanck, the son of Louis and Gertrude, was listed at this address in 1941. 1900, 257 3rd St. (between Garden and Park). Single family owning with morgage. Gone. 1905, 55 2nd St. Renting. 1920, 216 Hudson. Single family, owning. 1933, 18 Polk Street, Guttenberg, NJ. 1917-20, 107 Willow, Fred Kettler same address as his sister Gertrude Kettler and her, husband, Louie Blanck.